Winona Ryder Photos, News, and Videos | Just Jared Jr. SPOILER ALERT! DO NOT READ ANY FURTHER IF YOU DON’T WANT TO KNOW WHAT’S HAPPENING WITH THE SHOW! 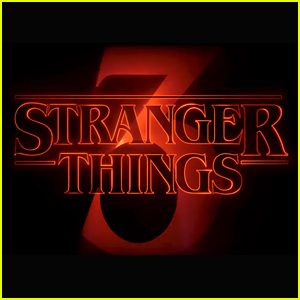 The Stranger Things is finishing production on Season 3 of their smash hit Netflix series! 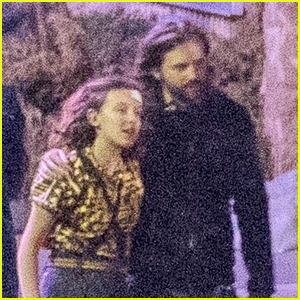 Several of the stars of the popular show were all spotted filming an epic finale sequence on Thursday night (November 8) in Duluth, Ga.
Millie Bobby Brown, Noah Schnapp, Charlie Heaton, Natalie Dyer and Finn Wolfhard were all seen on set. Winona Ryder was spotted in military gear, while Joe Kerry was dressed in a sailor’s outfit. Other actors were seen with visible cuts and scrapes. During the scene, many extras were seen dressed as soldiers running around as chaos ensued on set throughout the night. The second season of Stranger Things is getting closer and closer and today we are lucky enough to have received the trailer for the upcoming episodes! The new footage was shown during the Netflix series’ panel at Comic-Con on Saturday (July 22). 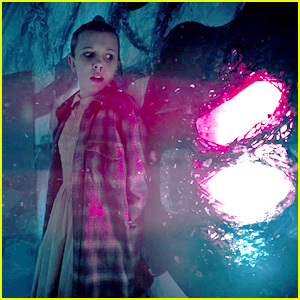 Make sure to watch all the way until the end of the trailer because you won’t get a glimpse of Millie Bobby Brown‘s character Eleven until then! The second season of Stranger Things will start streaming on October 27, so clear you schedule for that weekend for your binge-watch. First 'Stranger Things' Season 2 Photos Are Here! All of our favorite characters are back in these newly-released images from the second season of Netflix’s Stranger Things! In case you don’t know what the show is about, it’s set in 1983 Indiana, where a young boy vanishes into thin air. 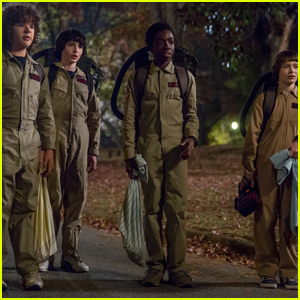 The new stills feature Joyce (Winona Ryder), Will (Noah Schnapp), Max (Sadie Sink), Nancy (Natalia Dyer), Jonathan (Charlie Heaton), Jim (David Harbour), Mike (Finn Wolfhard), Dustin (Gaten Matarazzo), and Lucas (Caleb McLaughlin). Stranger Things season two premieres Halloween on Netflix.